The Care Commission inspected our Nursery Class in October 2017. We are absolutely delighted to share the fabulous report with you. Many thanks to all staff involved for your hard work in creating a special learning environment for all of the children in the Nursery Class. Many thanks to Parents/Carers/Grandparents for your continued support and cooperation. Many thanks to our Nursery Pupils for being wonderful! Welcome to St Fillan’s Primary School’s website. I hope that the contents of these pages provide you with all the information you require about the school, our vision, values and aims, the opportunities for learning we embrace and the many successes we celebrate. Our Catholic Primary School provides a wide range of experiences and opportunities to develop the faith and learning of our children. We aim to develop the whole child; physically, emotionally, intellectually and spiritually, bringing them to full recognition of their abilities, skills and talents. All of our children are supported in learning by our hardworking and dedicated teaching and support staff. The school is also greatly supported by our parents, our committed Parent Council and Parent Teachers’ Association who work tirelessly for the benefit of all children. 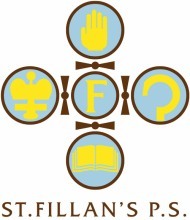 St Fillan’s Primary is a school which; highlights the positive, takes great pride in a sense of community and continually seeks new opportunities to foster extended partnerships for the benefit of learning and teaching and whole school life. If you require further information, or wish to discuss any aspect of this website, please do not hesitate to contact me. We are exceptionally fortunate and grateful to have two very active bodies in our PTA and Parent Council. Please click here for further information including how you can become involved with our PTA. Please click here for further information including how you can become involved with our Parent Council. The latest newsletter was added on Thursday, 8th November 2018. Other correspondence may be found under the 'Letters' link. Thank you.